The CFIA and Aliments Fontaine Santé Inc. have announced a health hazard warning and product recall against certain batches of Fontaine Santé Salads. The products are being recalled due to a possibility of contamination by the bacteria Listeria monocytogenes. Listeria monocytogenes is a harmful bacterium that is a common contaminant in food. Food that is contaminated by these bacteria does not look or smell spoiled. Common symptoms of a Listeria infection include high fever, neck stiffness, severe headache and nausea. In pregnant women, a Listeria infection can cause miscarriages or stillbirths. In people with weak immune systems, a Listeria infection can even cause death. To date however, there have been no reports of any Listeria infection that is linked to the recalled product. All recalled salads have ‘best before’ dates up to 2011 DE 26. The lot numbers of the recalled products are from 315 to 339. Recalled salads sold in 1-kg size were sold clerk-served in deli counters. 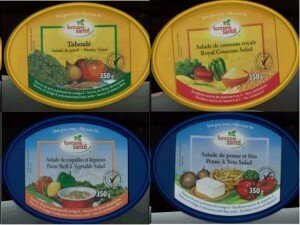 These salads are served in various sized-containers that have or do not have labels. The recalled products were distributed to different retailers in Ontario and Quebec. To get the complete list of the recalled salads, consumers can visit the CFIA recall site. They may also call Aliments Fontaine Santé Inc. at its hotline, 1-888-627-2683, extension 234.